Adult billbugs are small weevils, about 3/8 of an inch long, and brown or black in coloration. They have the distinct long snout and hard wing covers that are characteristic of the weevil family. Adult billbugs spend much of their time in the soil making them difficult to locate for identification. When adults are above ground, they are usually flightless and may be seen walking along driveways and sidewalks. The inability to fly prevents billbugs from traveling as far as some other pest species and means that billbug injury usually does not spread to cover large areas. Adults chew holes into grass stems where they lay eggs. After hatching, billbug larvae begin to tunnel and feed within the grass stems and rhizomes. As the larvae mature, they emerge from the plants into the soil where they feed on the roots (this occurs prior to pupation). Billbug larvae are white and C-shaped. They are easily differentiated from white grubs because they are leg-less and much smaller, measuring up to ½ an inch. They may be difficult to locate because of their cryptic tunneling behavior. Bluegrass billbug (Sphenophorus parvulus) adult and larva. Photo by David Shetlar, The Ohio State University, Bugwood.org. Adult billbugs usually do not cause noticeable injury to turfgrass but the larvae can cause significant feeding damage. Billbug injury can be identified by browning, straw-like turf in two to three inch round patches. To differentiate billbug injury from that of other insects, you can use the "tug test." If the injured turf is pulled, it will break away easily. The grass plants will have holes in the stems and small brown pellets of frass may be found around the stems of the grass plants. 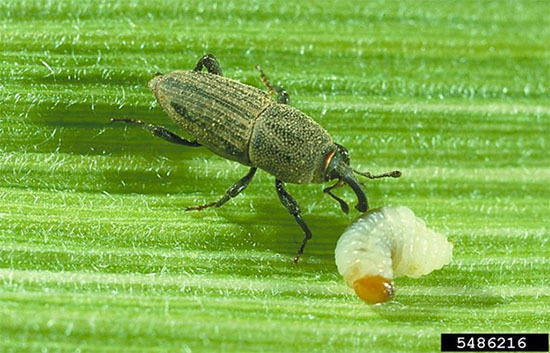 If 10 or more billbug larvae are found per square foot of turfgrass, action can be taken to control the insect and prevent further injury. Chemical controls for billbugs include chlorantroniliprole (Acelepryn) and trichlorfon (Dylox) which provide control within a few days of application. Chlorantroniliprole poses a lower risk to pollinators than many other chemical controls and trichlorfon can be used in areas where pesticides that breakdown quickly are preferred. Longer-acting, systemic insecticides, including imidacloprid (Merit), clothianidin (Arena) and thiamethoxam (Meridian), may take a couple of weeks to control the insects and will persist within the plants for some time. It is important to avoid applying neonicotinoid insecticides to lawns that have a mix of turfgrass and clover, to protect the bees and other pollinators that visit clover flowers.